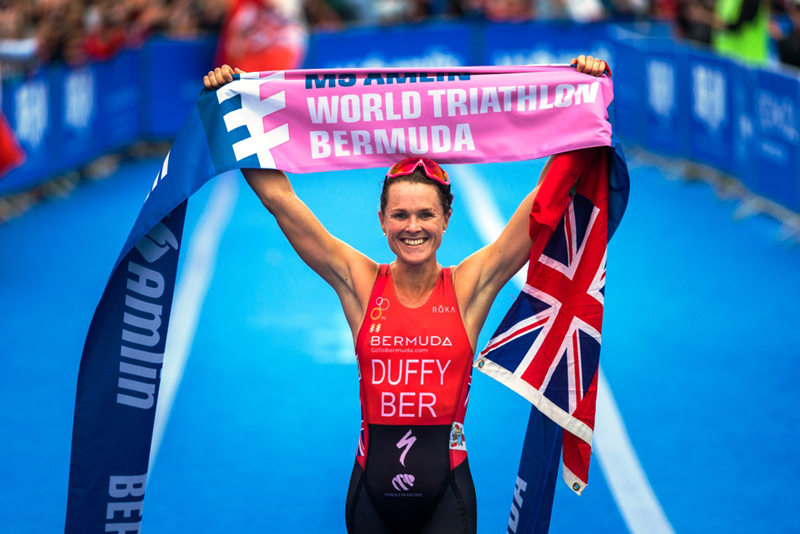 Clarien Bank has made a $5,000 donation to The Flora Fund established by Bermuda’s world champion triathlete Flora Duffy to help aspiring and talented local athletes reach their goals. The donation was presented by Michael DeCouto, Clarien’s Chief Digital & Marketing Officer, to her father Charlie Duffy during the awards ceremony at Saturday’s 30th annual Clarien Iron Kids triathlon – the event where Ms Duffy first began her competitive career more than 20 years ago. Ms Duffy is presently off island training for her next major race, the World Triathlon Series Hamburg in Germany on July 14 and said in a statement: “The Iron Kids triathlon is where I did my very first triathlon. I think I was seven years-old! Iron Kids helped launch a career that has seen Flora Duffy reach the pinnacle of her sport, earning multiple world championships. She was the ITU World Triathlon Series World Champion in 2016 and 2017, ITU Cross Triathlon World Champion in 2015 and 2015, and a four-time winner [2014-2017] of the XTERRA World Championships. In April she became the first Bermudian female athlete – and only the second Bermudian ever – to win a gold medal at the Commonwealth Games and she was awarded an OBE earlier this month for her services to sport in Bermuda. Michael DeCouto commented: “Clarien is honoured to make this donation to The Flora Fund. Flora has been an inspiration to everyone in Bermuda, not just for her spectacular world-class athletic achievements but for her humility and humanity off the race course. Those qualities are epitomised by the Flora Fund and her willingness to give back to the community. Contributions to The Flora Fund can be made online through the Bermuda Community Foundation’s donation page or offline by completing a Gift Intention Form. For more details contact the Bermuda Community Foundation at 294-4959. What a wonderful way to contribute to this important fund Clarien- excellent news.